Four interesting booklets in stencil print with sport activity programs for female soldiers, published by the General Staff and the National Committee. * Morning exercise for female soldiers. Booklet published by the general staff, stencil print August 1948. Instruction booklet for the guide; how to carry out morning exercises for female soldiers [Turn the head to the side and raise the arm to the side, two cone-shaped turns of the arm backwards and the head returns to the front with the lowering of the arm ...], including the names of the movements to carry out for the various parts of the body. 10 leaves. Jacket cover. * Sample female soldiers' fitness lessons published by the General Staff, August 1948. Stencil print booklet with examples of physical fitness classes for female soldiers ["Ten minutes of long-distance running. Walking while singing" etc.] 10 leaves. Jacket cover. 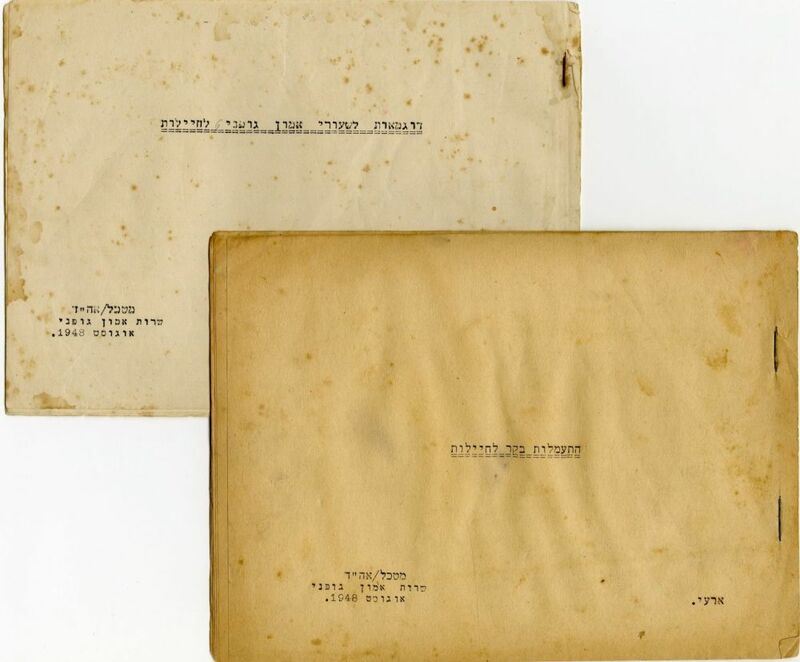 * Types of sport and sport institutions as processed by Yehoshua Aluf, "internal," published by the Vaad HaLeumi L'Knesset Yisrael, Department of Physical Fitness 1947. Stencil print booklet - something of a dictionary for sport terms. The booklet contains basic definitions of sport terms ["golf" - game of Scottish origin known from the 15th century ... at the end of the previous century, it entered Central Europe. It is considered "The Sport of Nobles. "], including a yearly listing of the Olympic games from 1896 to 1948. 21 leaves. Jacket cover. * Tabular Sports, published by the General Staff - "Recommendation for a competition in physical training for gatherings and celebrations for brigades, corps and services." Stencil print booklet with details about sport subjects relevant to performances, athletic professions, instructions for management styles and more. 10 leaves. Jacket cover. All four booklets are rare and not found in the National Library. Fine condition except for stains in some.